EOL. The e-puck robot is no more produced. The successor of this awesome robot is the e-puck2. 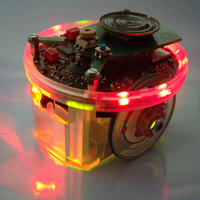 e-puck is the latest mini mobile robot developed at the Swiss Federal Institute of Technology in Lausanne (EPFL) for teaching purposes. It is now commercially available from GCtronic. e-puck is powered by a dsPIC processor and features a very large number of sensors in its basic configuration. The e-puck hardware and software is fully open source (www.e-puck.org) providing low-level access to every electronic device and offering unlimited extension possibilities. Low price - 850 CHF (~570 €, ~850 $). Quantity discount available.